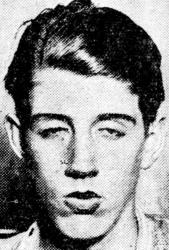 On this date in 1928, seventeen-year-old Floyd Hewitt was executed in Ohio’s electric chair for the horrific murder of a farmer’s wife and five-year-old son. He is not considered of normal intellect, his drooping mouth, dull eyes and appearances contributing to the opinion. He was not bright in his classes at school. On the evening of February 14, 1927, he visited a local farm belonging to the Brown family. He was a frequent visitor there; he loved listening to jazz music on the radio and the Browns were the only family in the area who had a set at home. Celia Brown’s husband, Fred, was away in town and she was home alone with their son Freddie. This news column and this article describe what happened in detail. Floyd got “stirred up inside” by the music. Feeling “an overpowering love,” he made sexual overtures towards Celia, who slapped him. He hit back, and she grabbed the fireplace poker to defend herself, but he tore it from her hands. In the ensuing fight Floyd hurled Celia down the stairs and struck her repeatedly with the poker until she was dead. Then, afraid the little boy would tell on him, Floyd chased Freddie into the basement and beat him to death with a baseball bat, too. Then he went back upstairs, washed his hands, walked the short distance home and sat down to read the newspaper. Fred Brown got home a little after midnight, found his wife’s body on the porch. There was blood everywhere. Fred summoned neighbors and the police. After searching the rest of the house, the neighbors found little Freddie’s body in the basement. Floyd rapidly came under suspicion; he literally left a trail of footprints right to his front door. The next morning he was arrested, wearing the same bloodstained sweater he’d worn the night before. One of the buttons had been torn off and was left at the crime scene. Within hours, Hewitt had made a full confession. He even went so far as to take the police on a tour of the Brown house to point out what had occurred and where. The next day, however, he retracted his statements and would maintain his innocence until his death. He was indeed an overgrown boy, only sixteen years old at the time of his crime, but the prosecution demanded the death penalty. Although indicted for two first degree murders (mother and son), he was tried only for the first degree murder of the five-year-old boy. During the three week trial, the state relied heavily upon Hewitt’s signed confession while the defense stressed Hewitt’s mental disabilities. On April 26, the jury returned a verdict of guilty without a recommendation of mercy. Hewitt’s chronological age at execution was seventeen, but his mental age remained forever fixed at ten. Floyd Hewitt might have been the youngest person ever executed by the state of Ohio, and he was the first from Ashtabula County. A “bedraggled figure … with his long black hair hanging low over his face,” and clutching a photo of his family, he died in the electric chair at the Ohio State Penitentiary Annex at 7:43 p.m.